“A rare Scottish sheep that subsists entirely on seaweed, and whose meat is highly revered, has officially become the first Slow Food Presidium in Scotland.” Read more here in this recent article from The Scotsman. Find out more about this native breed on Slow Food UK’s website. We’re proud to serve this uniquely-flavoured meat in our restaurants. If you are able to get hold of some, try this recipe from Fred Berkmiller. Sear the meat all over in duck fat in a heavy braising pan or pot (Le Creuset style) until dark gold colour. Add the onion, carrots and garlic. Sweat for a few minutes. Pour in the stock and bring to the boil. Add bouquet garni and herbs. Cover with lid and braise slowly in the oven for 2 hours. When cooked, cool and reserve until needed. Mince the meat, offal, carrot, onion, garlic and spinach. Add the egg and seasoning and mix well. If you wish, you can some spices like harissa. Roll the mixture into balls the size of a medium ladle. Wrap the caillettes in pig caul and bake in oven for 20 minutes on a buttered tray with a little chicken stock. Soak the beans for 12 hours then wash under cold water. Cover with chicken stock and add some water if needed. Bring to the boil, skimming at all time to get rid of the white foam, then add all the veg and simmer for about 45minutes or until cooked - but not over done. Nothing worse than undercooked beans! Use a large cast iron pot or terrine dishes, and lay the meat at the bottom. Then add the caillettes, the stock from the meat and pour over the beans. Add a little chicken stock until just covering the flat surface. Then add the duck or goose fat. Top with breadcrumbs and cook in the oven for 30-40 minutes. Eat straight from the oven when ready. Enjoy! Many of you will know that we started growing our own vegetables, salads and herbs at a Georgian walled garden on the outskirts of Edinburgh in 2017. Fred has been working hard to bring a beautiful, but rather neglected, garden back to life with the help of the owner Mary. Last summer and autumn both restaurants were using an impressive amount of produce grown just a few miles away. 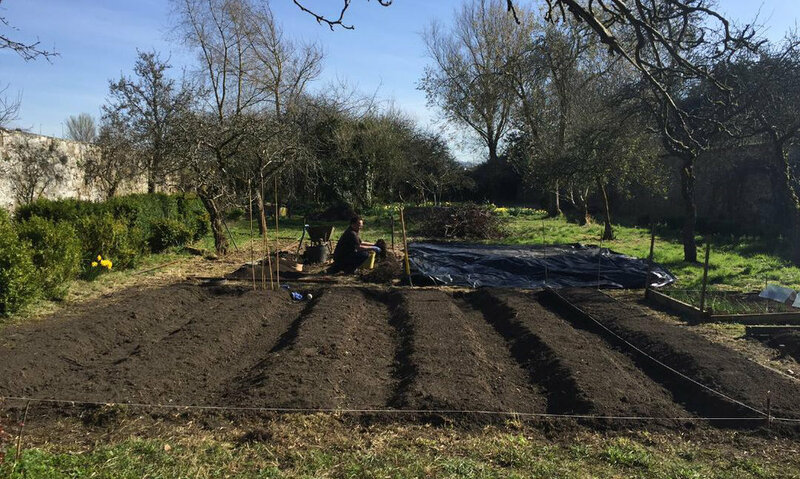 Here’s a quick update from Fred, who’s been busy preparing the garden for this year’s crops. Full winter is upon us but we are not on strike at Newton Garden! We’ve been spreading about 3 tons of composted manure, a ton of mushroom compost and 3 tons of mulch on existing beds, and we’ve made 5 new beds. Our new composters are in place and the nursery is ready to welcome our new seedling trays in the greenhouse in a few weeks. We still have lots of leeks, cabbages and lettuces in the polytunnel, as well as in our outside raised beds. And there’s still a fair amount of chervil, winter purslane, rocket, dill and mustard leaves to be picked. This winter was our first one growing lettuces and it has been a learning curve. I have high hopes of achieving a year-round supply of herbs and leaves for both restaurants – and it seems that will soon become a reality. We are only on our second winter, but I’m confident this year we will make it work! The summer too looks very promising. We’ve created new beds over the winter, doubling our growing space, so we should have a good, regular supply. This will be my third summer at Newton Garden, and I’m more enthusiastic than ever. There’s a lot to learn, but it’s satisfying in so many ways. I’m really looking forward to tasting this year's results. More news soon! There is nothing quite like the anticipation we feel for the third Thursday in November. For that is the day we welcome the arrival of Beaujolais Nouveau. Come along to help us celebrate! We'll be celebrating the French way at bleu with a selection of sharing dishes to begin, so we ask everyone to arrive at 7pm. To start, no less than six Lyonnaise-style dishes of bean salads, ox cheek pot au feu, pig snout, pig's ears and of course, smoked herrings. fish quenelle with bisque and Comté cheese, steamed potatoes. And to finish, cheese or a choice of desserts. Plus a large selection of Beaujolais crus available by the bottle and glass. Parfait! Since March, I have been growing and harvesting fresh salad leaves, herbs and vegetables at Newton Walled Garden, just outside Edinburgh. It is one of the most satisfying things that I have done as a chef. At the height of the summer, the garden was supplying both escargot restaurants with all of our salad leaves and a little more than 50% of all the herbs we need. I can't tell you how rewarding it is to plant a seed, nurture it, pick it and then to finally see that produce on the plate. Working with nature and the seasons is vital for a chef. Growing our own produce in the garden has given me a genuine sense of re-connecting with nature and its cycles. Tending the plants on a beautiful summer morning is incredibly fulfilling. It is almost like therapy. There are several reasons for doing this. Yes, there is a slight economic benefit from growing your own veg and herbs but that hasn't been my main motivation. Being able to grow better quality produce than I can buy from wholesale suppliers is more important to me. In the restaurants, we work hard to source the best quality meat, dairy, fish and drinks. We seek out the best producers we can and work closely with them. I want to be just as rigorous and as discerning with our vegetables and herbs. Growing my own seems to be the best way to do this. There are good, passionate local suppliers who grow high quality vegetables. Unfortunately, they are not geared up to supply the quantities required in the two restaurants. I don't want to buy from the mainstream commercial suppliers because I cannot trust their products. I don't believe in the methods they use. Recent events have highlighted problems in the poultry supply chain. We all remember the scandal of horse meat being mis-sold as beef from a few years back. We know there are fundamental problems with both the industrial livestock farming system and the supply chains that take it to the consumer. There is less awareness about the problems with industrial plant farming. I don't want to eat vegetables from Spain or Holland which have been sprayed with pesticide and fed artificial fertilisers to make them grow faster. Nor do I want to feed these things to my customers. By growing our own, I know exactly where my veg comes from and how it was produced. It has integrity. It has verifiable provenance and I can have faith in it. The produce from my garden tastes better. The flavours are more intense. They are not watery. By growing my own radish, lamb's lettuce or celery, we get a product which has a true flavour of itself. I also believe it is more healthy than commercially grown vegetables. I feel better after eating it and I want our customers to get those benefits too. Around 1.3 acres in size, the garden is owned by Mary Fawdry. It has been in her family since 1947 although their connections with the land go back a century. As a child, Mary ran barefoot around the garden. Several decades later, she still works in the garden every day. I am very proud to have a role in the garden's story and very thankful to Mary for sharing it. One of the reasons that Mary invited us into her garden was that she wanted to see it 'happily used'. She wants to see it have a wider benefit. Being involved in the garden has allowed us to employ a gardener. We also bring groups of school children to the garden and cook with them using vegetables that they have pulled from the ground. It all feels good. It all feels right and, I said, working this kitchen garden has been one of the most rewarding challenges of my career. We have plans for developing our work in the garden with Mary. I will tell you about them as they come to fruition. Now, if you will excuse me, I need to go and pick some leeks. Late last year, my favourite type of email dropped into my inbox. It was a completely unexpected email from a farmer in Perthshire who had somehow accidentally acquired some pure breed Mangalitsa pigs. According to this mysterious email, no-one in the farming world was interested in Mangalitsa pigs. As a chef with a reputation for producing what have been called adventurous menus, perhaps I might be interested in taking them? To be honest, I didn't know what on earth Mangalitsa pigs were but I didn't need to do much research before I knew that yes, I absolutely wanted them for my restaurants. It turns out that Mangalitsa, a slow growing breed which is expensive to farm, have been described as the Wagyu beef of pork. Like Wagyu, their flesh has a lot of marbling running through it. Regular readers will know that we like to use Wagyu beef from the Highland Wagyu farm in Perthshire. The thought of cooking its porcine equivalent was enough to make my mouth water. Their name in Hungarian means "hog with a lot of lard" and it is this fat which makes the meat succulent and richly flavoured. All of which means that I couldn't wait to get these pigs in the pot and on the menu. The only problem was that these Mangalitsa were some way off being pot-ready. In fact, we needed to find them a good home for a few months. Somewhere that would take good care of them until they were ready to take a starring role on l'escargot menus. At which point, we will introduce Josiah Lockhart, the General Manager of Gorgie City Farm. I am a big fan and supporter of Gorgie City Farm. We work with them throughout the year. Over the years, they have produced numerous pigs for us; several lambs, mutton and even the odd goat every now and then. Education is part of Gorgie City Farm's remit and that is something we are very happy to support. If we want the nation to have a healthy relationship with food then we need to know what producing it entails. Kids learning where their food comes from seems like a good starting point. Can you see where this is going? I met with Josiah and asked if he would like to look after my Mangalitsa for me. His eyes lit up like a kids' at Christmas and, a week later, nine pigs were heading towards their new home at Gorgie City Farm. I really recommend that you take your kids to visit the pigs. Entry to Gorgie City Farm is free and, as you can see from the picture, the Mangalitsa are super cute. With an eye-catching woolly appearance, they look more like sheep than the pink-skinned pigs we are used to seeing. I can't help but imagine that they are the sort of thing that might feature in an episode of The Muppets. This is what Josiah has to say about them: "It is a great product in terms of the meat but it is also ideal for the farm. It is something unusual and the parents and kids love it. The farm always needs more visitors and the Mangalitsa are one way of bringing them in." If you have never seen Mangalitsa before, it is because very few people have. Interest in them is growing but, at one point, they were so rare, that there were only 150 of them in existence. Originally from Hungary, the breed is derived from the Northern European Wild Boar. It is practically unheard of in the UK. Farmers aren't keen on them as they take a year to reach the right weight. That is about twice as long to rear as more commercial pigs. This makes them an expensive breed to farm. Working with Josiah, I am perfectly happy to rear my pigs at a natural pace. I reckon that the unique characteristics of the meat, partially a product of their slow growth, will make it worthwhile. Some things are worth waiting for. It reminds me of the way that the market for Dexter beef has developed in the UK. Ten years ago, when I started cooking with it, no-one was interested. Now, it's popular right across the UK. Already, fellow chefs are asking if I have any Mangalitsa to spare. Obviously, I am thoroughly enjoying saying "Non" to them. Although I am not so daft as to think that I will forever remain the only chef in town with a steady supply of Mangalitsa. I have yet to try the meat but Josiah had some a few years back. He describes it as dark red in colour with intense marbling. The texture is tender and soft while the flavours is said to be like beef but with a slight sweetness. Interestingly, part of the feed for our Mangalitsa comes from the Pilot Brewery in Leith. The farm takes the waste from their mash and feeds it to the pigs. It will be fascinating to see what effect that has on the flavour. Our first Mangalitsa from Gorgie City Farm goes to the abattoir in mid-February. We hope to have Mangalitsa on the menu by the end of February. I'm going to ask Rachel Hammond to use some of it to make charcuterie. I have yet to decide how I am going to cook the different cuts of meat but I am looking forward to working with this new ingredient. In some ways, the farm is similar to l'escargot restaurants. Like the farm, we get very excited in the kitchen when we have an interesting new product to work with and we know that our customers are very open to trying new things. Roll on February and the first Mangalitsa on our menus! 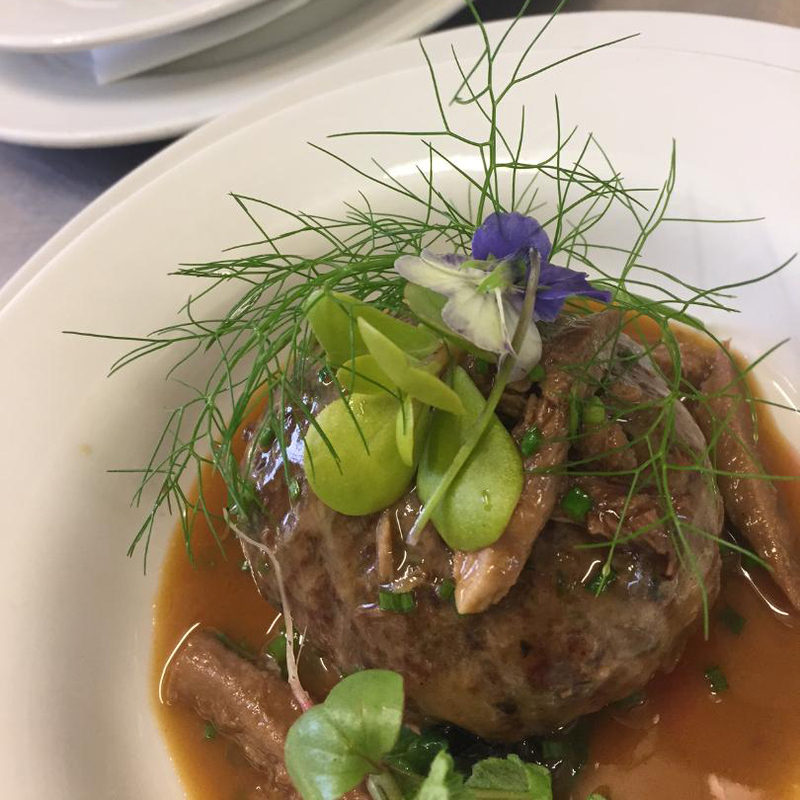 In the Escargot restaurants we like to use Native Shetland Lamb PDO (Protected Designation of Origin) from Richard Briggs, a farmer from Weisdale on Shetland. 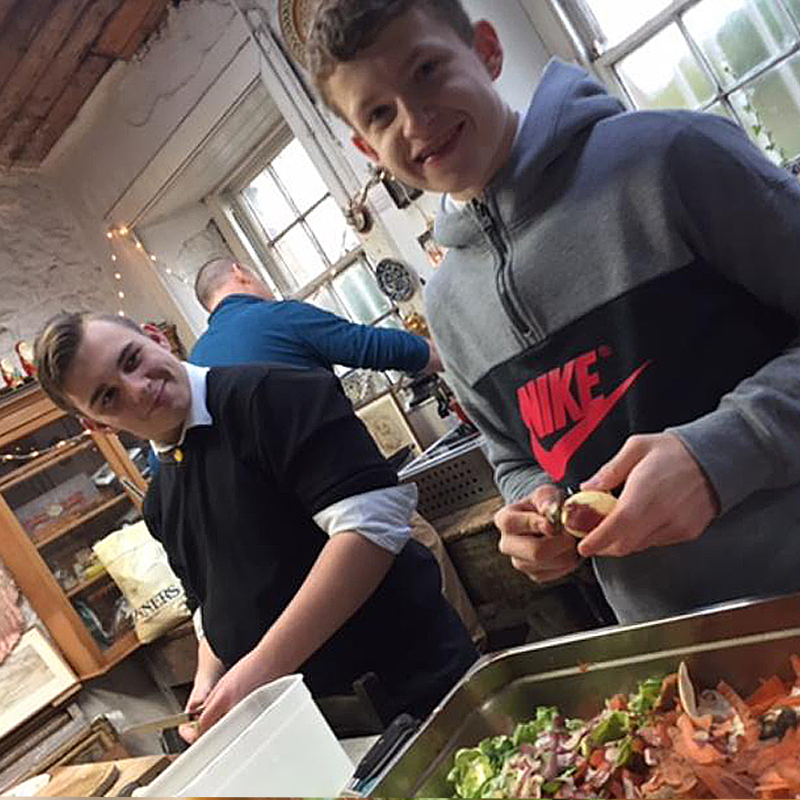 A fantastic first-hand experience at Campbells Prime Meat in Linlithgow, with senior butcher Gerry Neilson and Edinburgh College's chefs-to-be students. We are happy and proud here at l'escargot bleu for having been shortlisted once again in the i-on Food and Drink Reader Awards 2016. Remember you hold the voting power here so have you say and please vote for l'escargot bleu! Just like the hands of a clock, what goes around comes around. So when clockmakers James Ritchie & Son, a Smith of Derby company, were called out to build a new external clock for the award-winning Edinburgh restaurant L’escargot bleu, it was like stepping back in time. It emerged that the restaurant is housed in the clockmaking businesses former home and the projecting clock they were replacing was a James Ritchie original that had stood there for decades. James Ritchie & Son moved into the premises in Broughton Street in 1965, having previously been based on Leith Street. They left in 2006 and the clock came down at the same time. Fred Berkmiller opened his first Edinburgh restaurant in 1998 and went on to open L’escargot blanc in the west end. In 2009, he renovated an old clockmaker’s shop on 56 Broughton Street to open L’escargot bleu, a popular bistro steeped in French culture, and earlier this year they won a prestigious AA Rosette for culinary excellence. Both restaurants are renowned for serving a unique collaboration of classic provincial French cuisine with the finest Scottish, seasonal produce. Fred snaps up a Special Award! We are so delighted that Chef Proprietor, Fred Berkmiller, the face of L’escargot bleu and L’escargot blanc scooped the 'Special Award' at The List’s annual Eating & Drinking Guide Awards 2014. The awards highlight some of the best dining out experiences in Glasgow and Edinburgh. The judges’ Special Award recognises Fred’s commitment and contribution to Scottish food culture as well as his exceptional success with Budding Chefs.